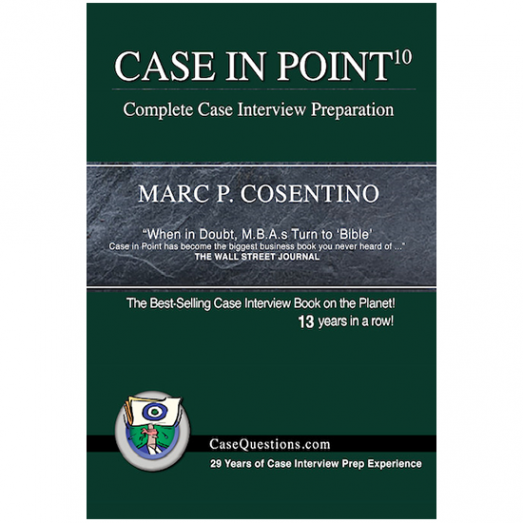 Case in Point is the #1 selling case book on the planet 13 years in a row, the #2 selling interview book on Amazon eight years in a row and the #1 selling consulting book for nine years! It is the choice of the Wharton Consulting Club, the University of Michigan Consulting Club, and the University of Virginia Consulting Club just to name a few of the schools that buy CIP in bulk. Paperback includes 220 jammed-packed pages of helpful interviewing hints, frameworks, 35 practice cases, 21 Ways to Cut Costs and more!